The early story of a British astronomer's life. Sir Fred Hoyle is one of Bingley’s most famous sons who became an astronomer and coined the term ‘Big Bang!’. He was born in Gilstead in 1915, the son of a wool worker. He spent his childhood exploring the paths, woods and moors of the town, which undoubtedly formed his early interest in Science and Astronomy and led to his ground-breaking research in scientific matters and his many novels. 3. Buy the Leaflet – Only £1.50! Three local walks which illustrate the early story of Sir Fred’s life. Bingley Walkers are Welcome have designed three local walks which are now available in a single leaflet, illustrating the early story of Sir Fred Hoyle’s life – his childhood home and surroundings, his family connections with the Salt family of Saltaire, his school days and where he would explore as a child. 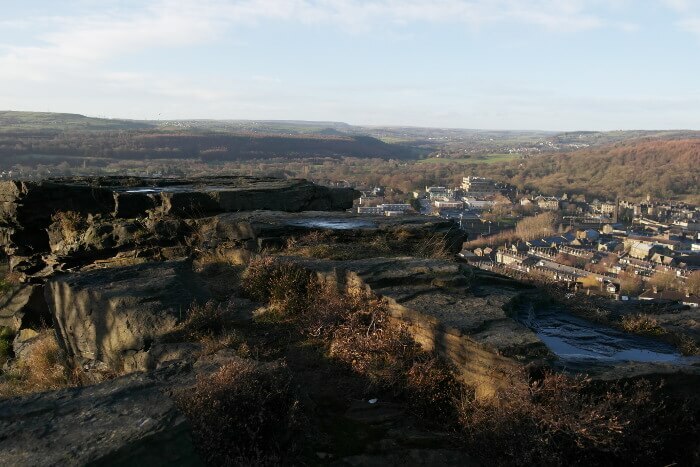 During these walks, you will find endless opportunities to explore historical sites of interest, special areas of scientific interest and an abundance of nature, wildlife and the some of the best sights that Bingley has to offer. Our three walks cover extensive areas of Bingley town centre and the villages of Gilstead and Crossﬂatts. Each walk in the leaflet is indicated on a map with detailed, step by step descriptions. Our range of walks have been designed so that people of all ages and abilities can enjoy them and families can get out and discover for themselves why Sir Fred was so inspired by exploring our wonderful town! Thank you to Bingley Town Council for supporting us producing this leaﬂet. In 2017, Bingley Walkers are Welcome were awarded a grant by Bingley Town Council which was used towards organising our first walking festival and also producing a walk leaflet celebrating Sir Fred Hoyle’s early life in Bingley and surrounding areas. Gilstead is a village above Bingley and is where young Fred Hoyle lived. In this walk, you will find all the buildings and features associated to his many childhood wanders. Most importantly, you will see the house where he lived in with his mother, a cottage belonging to the Milnerfield Estate. The walk also includes Hirst Wood and part of Shipley Glen where he would have explored as a child. This walk is all about the places where young Sir Fred spent time observing the many wonders of engineering and manufacturing factories surrounding Bingley at the time. From these factories and workshops to the great Five Rise Locks, there was much to distract and interest him! He actually spent more time watching the various trades than attending school. In this final walk, you will discover some of the best features Bingley has to offer. We imagine that young Fred Hoyle would have used many of the old snickets going up and down the town on this walk. The highlight of this treck is walking up to the Prince of Wales Park and across to Gilstead Crags where the view from this moorland over the Aire Valley is quite breath-taking! Buy the Leaflet - Only £1.50! Looking for something else? Why not take a look at other walks in Bingley we have for you? The routes are not waymarked so for full comprehensive directions and anecdotal comments about Sir Fred Hoyle along the way, we invite you to buy our special leaflet which we have designed and produced. It’s a very handy four x two fold format that will keep in your pocket and includes the routes highlighted above on an illustrated map. There are “points of interest" dotted on the map, highlighting places where young Sir Fred would have spent time when living in Gilstead, Crossflatts and Bingley. The leaflet also includes various quotes from Sir Fred himself. Below are local shops and cafés where you can buy the leaflets. In a near future we hope to be able to organise mail deliveries, so bear with us in the meantime! For the initial idea: A huge thank you to our own walk leader Ronda Christensen for having the idea in the first place and devising the walks. Also to everyone who has checked and double checked the walks which we are confident are word perfect – thank you Sue Dennis and Maureen Carney whose trained eyes and expertise at proof reading was invaluable! For the production and print: a big thank you to Emma at FullStop Studio for her expertise in designing the leaflets and for her patience! Not forgetting our Chairwoman Christine McCabe for coordinating and managing this project.